Much like butterscotch, I never thought I liked maple syrup. The taste just wasn’t appealing to me at all. It was a bit too sweet without a lot of substance. Then at some point I realized that I was basing my opinion on pancake syrup. Trust me, that’s not maple syrup. But once I tried real maple syrup, I realized that it is actually quite lovely. A good quality maple syrup has a nice sweetness and a rich flavor that’s tough to beat. Now I happily embrace it and use it in my baking and even in making granola. It’s good stuff! 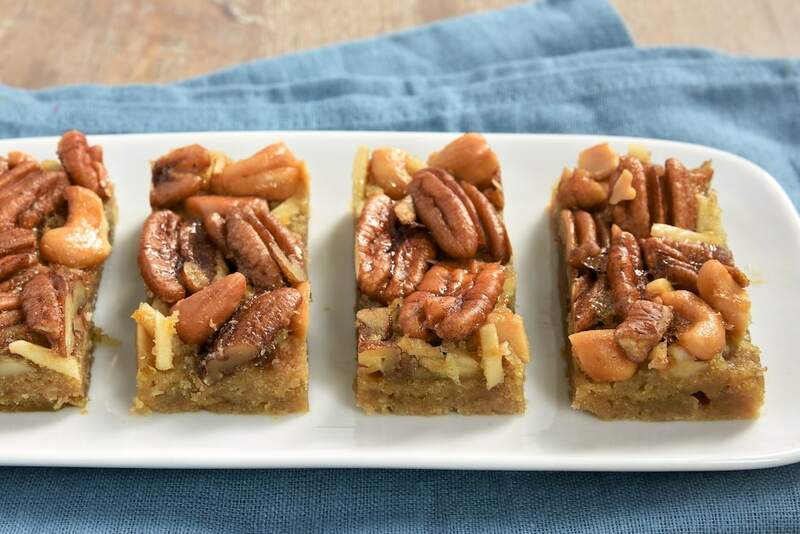 These Maple Nut Bars are a delicious twist on traditional pecan pie bars. 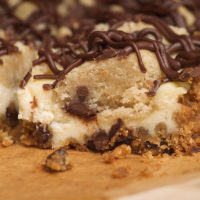 The maple syrup adds a wonderful flavor while still maintaining that trademark gooeyness of the bars. You’ll get a great sweet/crunchy combo that is really irresistible. 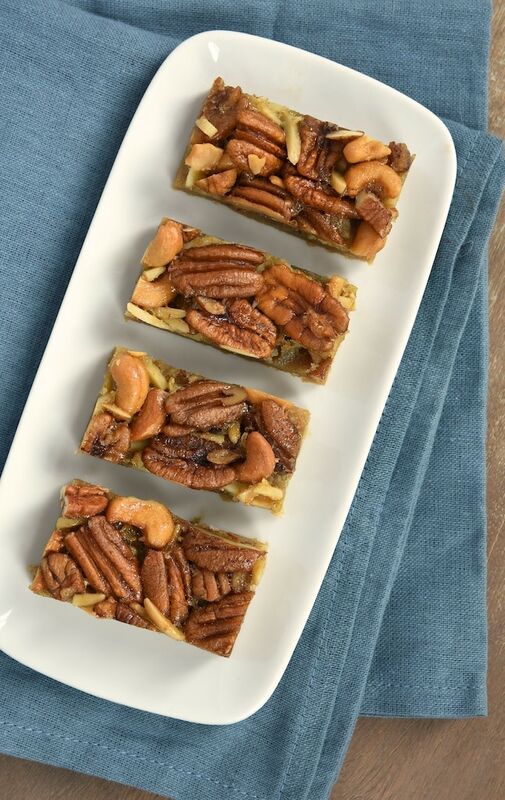 I used a combination of nuts from my pantry – pecans, cashews, almonds. 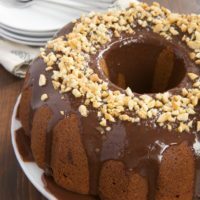 You can, of course, just use one kind of nut or a few of your favorites. I like the look of whole nuts with these. But chopping them works just as well and will make them a little easier to cut. If you don’t already have a favorite maple syrup, there are a few things you need to know for choosing one. First of all, check the ingredients and make sure it’s maple syrup. Then, there are the grades of maple syrup. Just remember that the darker the syrup, the bigger the flavor. For baking, I tend to like Grade A Medium Amber (also known as Grade A Amber Color with Rich Taste) but that’s just my preference. 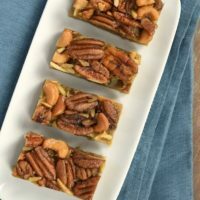 Whether you have a long-standing love of maple syrup or are a newbie fan like me, you’ll enjoy these sweet, nutty, rich, crunchy bars. They are great year round, but they seem to say fall to me in a big way! Preheat oven to 350°. Grease a 9”x13” baking pan. Line with parchment paper so that the ends overhang by a couple of inches on the two short ends. To make the crust, whisk together flour, brown sugar, and salt. Add butter and mix using a pastry blender or a fork until combined. The mixture will be crumbly but will hold together when pinched. Press crust mixture evenly into prepared pan. Bake for 15 minutes or until edges are lightly browned. Set aside. Place eggs in a large bowl and beat lightly. Add maple syrup, butter, brown sugar, sugar, and salt, stirring until combined. Stir in nuts. Pour filling over partially baked crust. Bake 30 to 35 minutes, or until filling is set. 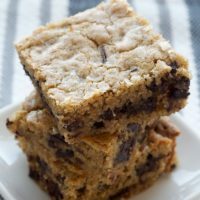 Cool bars to room temperature in pan. 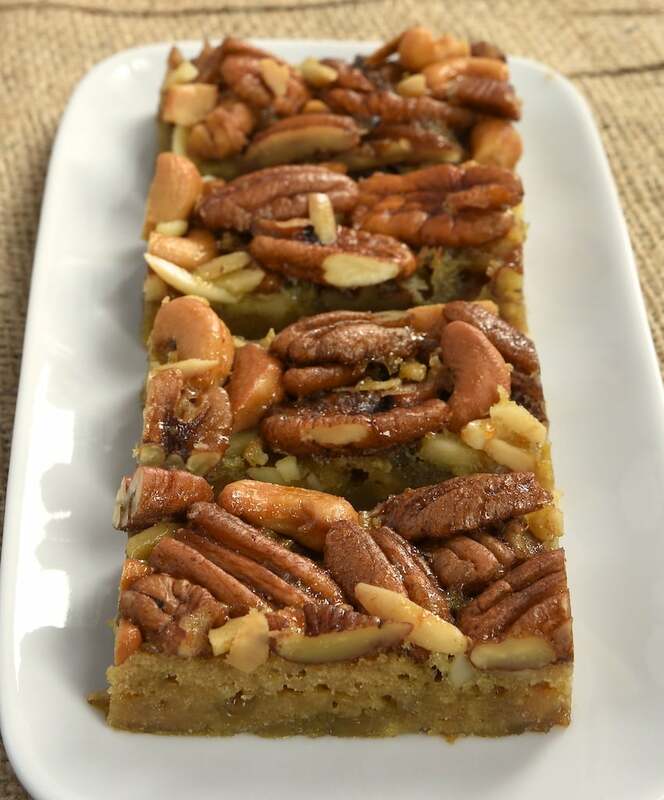 Using the overhanging parchment paper, lift the bars onto a cutting board and cut into bars. Oh wow! These sound so good! Can I eat them with vanilla ice cream?! Yum! you’ve hit a number of my favorite food flavors here. 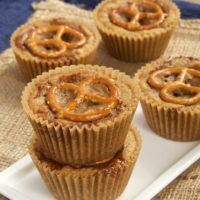 I consider this recipe a winner and I haven’t even tried it yet! These bars look glorious!! 🙂 And I agree with you about real maple syrup-SO good!! Maple is defintiely one of my favorite flavors of full. THe fact that these are extra nutty makes me love them all the more! I wonder if Kayro Syrup would work. It comes light or dark. I use the light quite often, especially in Pecan pie. 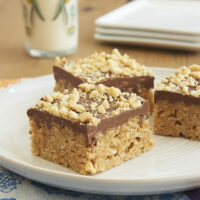 These bars look delicious!! Yes, you should be able to substitute corn syrup. I’m glad you like them, Lara! By the way, I’m betting your Gilmore Girls afternoon was tons of fun!